Tune in during classical programs this week as we celebrate Italian conductor Claudio Abbado, who passed away on January 20th at the age of 80. 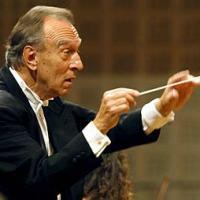 Mr. Abbado lead many of the world's premiere orchestras during his long career, serving as principal conductor of the Berlin Philharmonic and the London Symphony Orchestra, and principal guest conductor of the Chicago Symphony Orchestra. He also held positions as music director of both La Scala opera house and the Vienna State opera. Mr. Abbado was known for his incredible musical ability, conducting his programs without scores, as well as his support for young musicians. He was named a Senator for Life in the Senate of Italy in 2013 for his contributions to music. Normally scheduled classical programs from Tuesday, January 21st through Thursday, January 23rd will play works conducted by Mr. Abbado.